Cleaned and adjusted 2nd player “100” reel contacts. Cleaned Player Unit in the back box. Cleaned and adjusted right roll over switch. Replaced all rubber on playfield. This game is ready to go! On to the next one. 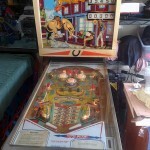 This entry was posted in Repairs, Mods & Shop Outs and tagged em, gottlieb, machine, mustang, Pinball, repair by Pinball Shark. Bookmark the permalink.